This site lists the genealogical data of our known ancestors and descendants. Much of the genealogical data was collected by Philip G. Parsons and Hazel K. (Quint) Parsons, parents of Raymond E. Parsons. Additional contributions to the data have been made by me and other relatives, near and distant. The data was organized and placed in computer format by me (Ray Parsons). Last up-date was March 15, 2003. There are over 3200 individuals, over 950 families, and over 500 surnames in the files. The genealogical data appears on RootsWeb World Connect in the Family Trees database of PARSONSR. You can access the Rootsweb site at http://www.rootsweb.com/ Go there and click on FAMILY TREES at the top of ROOTS WEB page, then enter PARSONSR in the box for the NAME OF THE DATABASE. Prior to March 2003 the data could be accessed directly from this site but that access has been removed. It was removed to protect the security of “living” individuals and help prevent the problem of “identity theft” of living individuals in the database. By sending my GED file through Roots Web the first names of “living” individuals are replaced with “LIVING” and all dates associated with them are deleted. If no death date appears in the GED file then the individual is listed as living if born less than 100 years ago. This may cause some deceased individuals to be listed as “living”. Going though Roots Web makes the files easy to update from a GED file and distributes the data to a wider audience. At the same time any potential “identity theft” is thwarted. My personal files continue to have data on the "living" but will remain confidential. 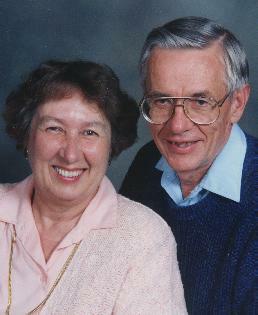 Phil and Hazel collected many stories of biographies and events in the lives of many relatives. Their stories plus other stories and photos were added to Ray Parsons' Web page. The photos and stories are found on Ray Parsons' home page. Go back there to see them. Some are very interesting, DON'T MISS THEM. To go to Ray Parsons home page click here. About 1800, several Parsons families were living near Tullamore and Killeigh, King's County (now County Offaly), Ireland. In 1841, the widow of Robert Parsons, Hannah (Banks) Parsons, left Ireland for Zanesville, Ohio with a daughter, Hannah, and two sons, Charles and William. She was following her oldest daughter, Maria Parsons, who had married John Banks a few years earlier and gone to live in Zanesville. An older son of Hannah, Richard, emigrated from Ireland to Zanesville with his wife and seven children in 1848. Although, protestants were a minority in Ireland, these families were protestant and the root of this line of the Parsons family in the United States. Mary Gye born about 1580, married John Maverick and their son, Moses, married Remember Allerton who came on the Mayflower ship. Remember Allerton was an ancestor of my mother, Hazel Quint. Mary Gye is listed in the book "Ancestral Roots of Certain American Colonist" by Fredrick Lewis Weiss, a noted historian and genealogist. The seventh Edition, printed in 1993 (Genealogical Publishing Co. Inc.) was used to outline the ancestors of Mary Gye (line # 261 in the book) and place some of them in this data base. This allowed tracing ancestral connections of Hazel Quint back through Knights, Earls, Lords, English Kings, Alfred the Great, William the Conqueror, Charlemagne, early Kings of Scotland, France and Italy, to as early at Afranius Syagrius, a Gallo-Roman Consul in 381 A.D. Reference to the information from the book is noted in the GED file; for example, Mary Gye is Weiss, 261-44, using Weiss' system for designating Line 261, Generation 44 in his book. The SMITH surname was taken on by William HUNSINGER in about 1880 in Effort, Pennsylvania. His HUNSINGER ancestors are believed to have come to Pennsylvania from Germany in about 1749. Mary Louise (Smith) Parsons' mother was Luella ZIEGENFUS. The ZIEGENFUS family were early settlers of Montgomery County, Pennsylvania. They emigrated from near Strasbourg, Germany to Philadelphia, arriving in Philadelphia, October 28, 1738. This branch of the family settled in Aquashicola, Carbon County, Pennsylvania in about 1800. To go to Ray Parsons home page click here.